If you’re thinking about going whitewater rafting, one thing that you want to consider is the cost. 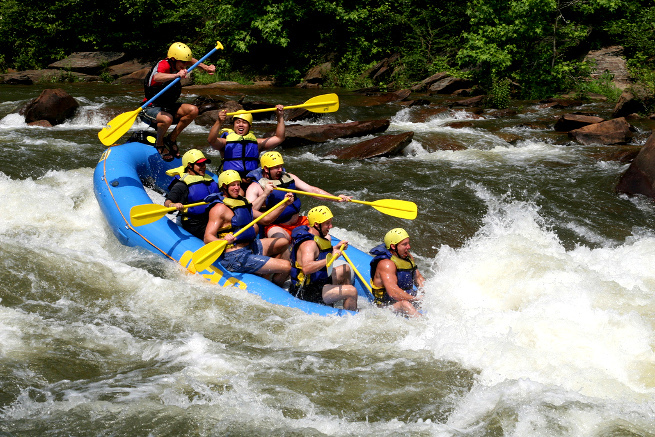 The price of a whitewater rafting excursion depends upon several factors. These include the difficulty of the river, the length of trip, and whether or not you are going to have lunch while you are rafting. If this is your first time rafting, you should choose a river that’s suitable for beginner rafters, which means there won’t be a professional guide in every raft (ie, lower cost). If you have rafted before and want to attempt something more challenging, the more technical rivers usually necessitate having a guide in every raft. This means the cost will run a bit more. Most rafting companies offer a half day as well as a full day trip on the water. Half day trips are less expensive than full day trips. Most full day trips include a picnic lunch by the river. If you are choosing this option, you can expect typical picnic food, like sandwich fixings, potato chips, cookies and the like. Some rafting companies go all out and actually set up a hamburger/hotdog cookout at a special spot on the river. If you choose a full day trip, you can expect a full morning of rafting, followed by a break for lunch, and then a couple of hours after lunch so the group can run a few more challenging rapids before taking out for the day. Location matters! If you choose a popular river with a lot of rafting companies running trips, there may be more competition for your reservation. This can result in a variation in price, and at times you may even find a newer rafting company that may charge a little less in order to get your business. If you wear sunglasses or regular glasses, be sure to bring along a strap to keep them in place during your rafting. This will save you from having to purchase one from your rafting company (an easy way for them to add a few dollars to your expenses). Also make sure that you have appropriate footwear for the trip: this means old sneakers or sandals that have a strap in the back: check with your rafting company for specifics on what they require. You don’t want to get all the way to the outpost and then be told you need to purchase a different type of river shoe. Usually a rafting company will have a team photographer who will document your journey. If you are interested in purchasing photos of your trip, you can expect to pay $35-40 for a CD of the participants in your raft. This enables you to post great photos of your trip on your social media sites! Don’t pass on this option! If you are traveling with a group, you may qualify for a group rate. Another thing to inquire about is whether or not any discounts are available when you make your reservations, such as military or student discounts. No matter which option you choose, remember one thing: no matter what the cost, your whitewater rafing trip will create memories that last a lifetime. Enjoy the river!